According to the research of a Germany Institute, China will leapfrog to the first place in the world list of annual car output, exceeding 14 billion in 2013. Running cars are not less than 100 million vehicles, according to each car tires replaced 2 times per year on average calculation. Waste tires left are over 800 million every year and the number will continue to rise by double digit yearly. 70% of waste tires are not reclaimed for use, besides, less than half of waste bias tires are reclaimed. China is currently suffering from an insufficient rubber source, which is mainly exported from outside countries. Hence, to improve the management of reclaiming waste tires has called an immediate action. A simplest method to handle rubber wastes is to produce reclaimed rubber powder and refine oil. Comparatively, producing reclaimed rubber restricts the future development of reusing rubber wastes as a result of its disadvantages like the high manufacturing cost, narrow sales channel and short service life of plastic runway and other rubber products. Oil refining has attracted people’s attention with its good sale, fast turnover speed on current fund and high profit margin. For instance, the average price for recycling waste tires in China is 1150 RMB/ton at present; the rate of oil refined from waste tires is up to 45% plus the production cost like fuel, labor, water and power expenses; therefore, to produce one ton of tire oil will only cost about 2400 RMB, compared with its current market price 3800 RMB/ton to 4800 RMB/ton. 1. Dispose the waste rubber tires comprehensive to produce two products—carbon black and tire oil at the same time. 2.1. Pre-treatment device for raw materials. 2.2. Rapid and continuous feeder. 2.3. Integrated rotary cracking device. 2.4. 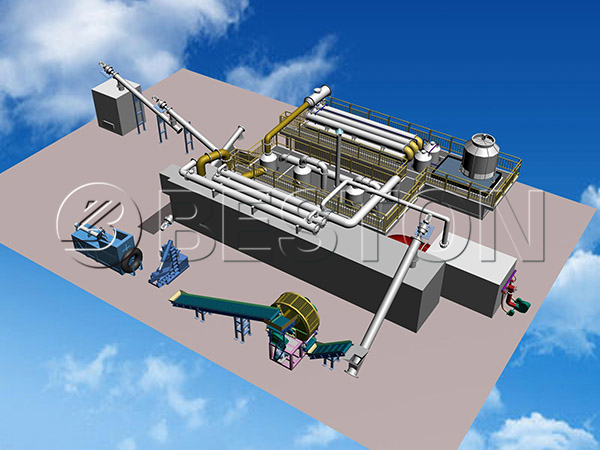 Automatic slag discharging system with characteristics of safety and environmental protection. 2.5. Whirlwind de-dusting device with oil steam. 2.7. Exhaust purification, recycle and combustion system. 2.8. Heat source supply system. 2.9. Environmental protection and exhaust system for heat source. 2.10. Central electric control system. 3.5 High effective fuel gas heating system: when the temperature of the heated gas reaches to 150℃, a large amount of gases—-methane to butane—that cannot be fluidified in common temperature and pressure will be generated. And these gases can generate a large amount of heating energy after being burned fully in our specially designed gas burner, thus saving energy to a large degree. All series of equipment sold by our company can be enjoyed the perfect after-selling service and the free repair service for one year as well as the maintenance service for the whole service life, thus completely resolving the customers’ troubles after buying. Energy source has been the main factor limiting the economic development of each country since the 1990s with the daily increasing trend of petroleum in short supply, the petroleum explored in the whole land of the globe will be exploited out in 35 to 45 years! Seeking new energy sources has become the question all countries in the world focus on. China has a broad tract and a large population, and with the rapid development of the market economy and the popularization of vehicles and machinery, the demands to petroleum is increasing continuously and China has changed from a petroleum exporting country to an importing country. In the first half year of 2009, we still need to import 200 million tons of crude oil from foreign countries to be able to meet the demands of domestic market except the domestically produced crude oil in accordance with the news publicized by China Petroleum & Chemical Corporation. Since 2010, the international price of crude oil increases time and again, and the price of each bucket of crude oil has exceeded 92.78 dollars (quotation from OPEC in January 7, 2013). At present, China annually output on car ranks to the first in the world with an output of more than 13.2 billion pieces in 2012, running cars are not less than 100 million vehicles, according to each car tires replaced 2 times per year on average calculation. And the number of annually brought waste and old tires is more than 800 million pieces. 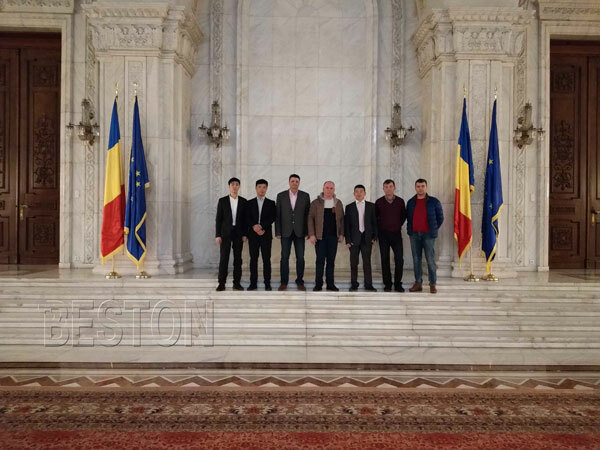 Therefore, a country will not need to worry about the supply of its raw materials, if it establishes one hundred factories, with an annual ability to dispose 45000 pieces of tires annually so as to extract carbon black and tire oil. 1. This device has rapid, continuous and canned feeding and tapping system and the efficiency is more than three times to the traditional Intermittent Operation Equipment. 4. Catalyzing heat split technology and chemical extracting technology for product; we can provide special catalyst according to different requirement of customers. The catalyst can decrease the sulfur content and density and solidifying point, improve the smell and color, remove the impurity of the fuel oil. It solve the problem which plagued plastic recycling project with the disadvantages of lots of impurity, bad smell and difficult to store. Take the fuel oil from tires for an example, the color of oil will be changed from black to transparent red, and the oil can keep longer time for store with better oxidation-resistance. 3. The equipped environmental protection fittings are more perfect, such as waste gas burner, and flue dust chamber. 4. The equipment has reasonable design and advanced manufacturing technologies and a high automation degree and complete safety facilities. 1. Waste and old rubber tire. 6. Regeneration of waste PMMA (poly-methyl methacrylate). The security of main device, the main components of the exhaust gas that cannot be liquefied are alkenes class from C1 to C4, whose direct burning is dangerous. Therefore, we shall first make them pass water seal of the first safety device before burning up them as fuels, and further make them pass the gas burner of the second safety device; then the complete safe production shall be realized. The residue left from catalysis and split of waste tires is carbon black and steel; there is no waste solid left. 1. The area of the site is 600m2, including 300m2 workshops and 1000m2 material storehouse and auxiliary area. Monthly profit: 274360.00 RMB, put into operation within 30 days after device enters factory; capital can be totally recovered shortly in normal production condition.